Today I want to bang the drum for one of the other magazines in our department. We often refer to sister titles….Well, this one’s more like a granddaughter title. It’s The Official Jacqueline Wilson Mag – which I’ll abbreviate to JW Mag for the sake of my word count. Have you seen it? It’s absolutely brilliant. And I’m not saying that in order to sell more copies for them. They’re doing that very well for themselves by being quite excellent. I was at a meeting today and there was a copy of the latest issue on the table. I often browse other women’s mags – but not the younger titles. But I picked this one up, drawn, naturally, by the words Story Starters on the cover. Inside is a grid of squares headed Characters, Events, Outcome. Cut them out, shuffle them, and get started. Cool. As I flipped through the magazine, though, I was more and more blown away by it. It’s brilliant at encouraging creativity: drawing, writing, thinking, dreaming. Girls love children’s author Jacqueline Wilson and her Tracy Beaker character. So, of course, it’s about reading, too. And one of the very special things about this magazine is its dyslexia friendly font, so every child can read from the same page. That’s wonderful. Honestly, I’m coming across as a teen fan myself, I’m so impressed by it. But as well as appreciating the magazine for what it’s doing for girls, I’m aware of how valuable it is for us, too. Its readers, girls who want to read, are our future readers. Girls who learn to express their creativity in stories and poems are our future writers. Those who practice their drawing could be our future illustrators. I feel like making up one of those “I’ve seen the future” quotes: I’ve seen the future and it’s full of creative brilliance. Thank you, JW Mag. 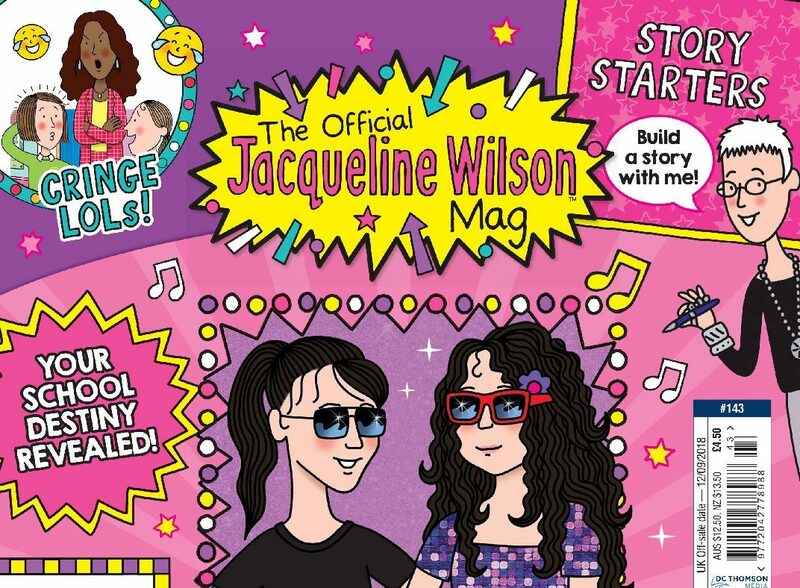 The latest (fortnightly) issue of The Official Jacqueline Wilson Magazine, no 143, is on sale now. Buy it for your young ’uns and see them walk in your creative footsteps.